For my recent birthday, my parents trumped all their past gift-giving endeavors by giving me a one-night stay at a hotel on Mackinac Island and free dog-sitting. And because they know sometimes we procrastinate or let life pass us by, they went ahead and arranged everything with Ryan down to the reservation date, so we were locked in. Friday night we headed up north yet again! We stayed in Traverse City for the night, had a big breakfast as only moms can make, kissed the dog goodbye, and were on our way! 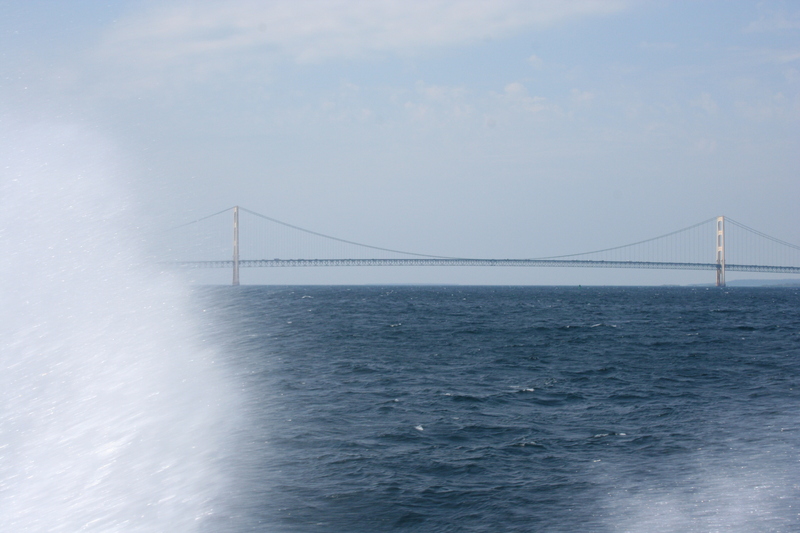 Mackinaw City is only two hours away from Traverse City, which is where we caught the ferry over to the island. The last time I was on Mackinac Island I was about eleven or twelve. For those of you keeping score at home, that was only about ten years ago, right!? (Ha, I kid.) There were a couple parts of the Island I vaguely remembered – like the haunted theater, which still creeps me out – and the outside of the fort. We were there for a little over 24 hours, and I think we really packed in the adventure! I do have a few personal favorite highlights… Topping the list was lunch at the Mission Point Bistro on the Greens – a patio dining area in the middle of an 18-hole putting course, directly on the water. The food was delicious, the beer was cold, and our view was ridiculous. Next would be renting a tandem bike and peddling in and around the island – I was skeptical, but it was hilarious! Ryan and I made such a good team! My last highlight had to be our bike ride on the second day. We rented regular bikes in the morning and rode around the perimeter of island before it was really filled with people. The bikes were super nice (I think it might get one!) and the ride was just so fun. We walked, took roughly 300 pictures, rode bikes, had some great beer, people watched, and ate ourselves silly. It was fantastic! I can’t wait to go back! A little afternoon rest stop. Flowers and ferries, quintessential Mackinac. Yes, we rode a tandem bike. Bird B & B, tucked in the flowers. Only the classiest way to tie up a horse. So many interesting houses and hotels. A library! On the lake! With a view! View of the island from the docks. Tired and happy, waiting for return ferry.